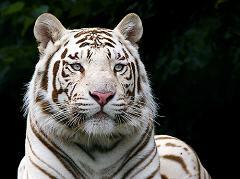 White tigers have white or almost white fur, and their unique coloration is caused by a recessive gene. There aren’t many white tigers left in the wild due to over-hunting of their pelts, and they are considered an endangered species. White tigers are a rare sight, and their eye-catching whiteness puts them at a disadvantage when they’re trying to sneak up on prey. However, the place where a white coat would be an advantage is in a zoo, and more than a hundred white tigers live in various zoos around the world. All of them are the descendants of a white cub that was caught in India in 1951 and given to the National Zoo in Washington, D.C. Unfortunately, the white tigers on display are the result of severe inbreeding of siblings, cousins, and parents mated to their own cubs. This single-minded determination on the part of humans to have a supply of the crowd-pleasing white tigers has resulted in deformities like back problems, hip dislocation, and crossed eyes. Because of these genetic problems, hundreds of cubs have had to be destroyed along the way. Currently, there are only a few thousand white tigers left in the wild. These are the hazards of show business. How many Camels are there Left in the Wild and How many are Extinct or Endangered?